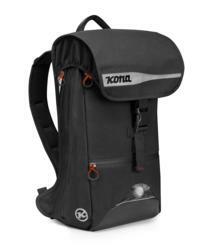 Kona Project 2 bike bags by Brenthaven were designed to survive the rigors of the Kona lifestyle. Collaborating with the Kona team allowed us to gain deeper insight into the biker lifestyle. Together, we created a product that has raised the bar for what a bike bag should be." Protective, stylish and created for the biker enthusiast, Brenthaven is extremely excited to announce the launch of the Kona Project 2 Collection. The Kona Project 2 bags by Brenthaven are designed to withstand the rugged Kona lifestyle, offering unparalleled carrying comfort in a water resistant pack, all backed by a 100% lifetime guarantee. Scott Armstrong, CEO of Brenthaven says, “The Kona Project 2 Bike collection is an exciting new direction for Brenthaven. Collaborating with the Kona team allowed us to gain deeper insight into the biker lifestyle. Together, we created a product that has raised the bar for what a bike bag should be." Combining the trust and knowledge of the Kona team and the bag expertise at Brenthaven, we have collaboratively engineered the ideal biking companion. Built to last, these durable bags feature a water resistant external 1000d cordura and a 100% waterproof internal drybag custom fit for laptops up to 16” (drybag inside messenger bag only). The Project 2 line is available in both backpack and messenger styles with the option of a black or blue colorway. The cases feature a battery operated safety light, patent-pending magnetic hydro-flaps (which helps prevent water leakage into the messenger bag), 10 custom storage compartments engineered for your biking essentials, and ergonomic shoulder straps which help you carry the load. Finally, a bag that can keep up with you and your lifestyle. Follow us on Twitter.com/brenthavennews and become a fan on Facebook.com/brenthavennews for access to special deals on Brenthaven products. At Kona, we're all about the freedom and empowerment of the bicycle. We have been since 1988. We still have the same founding owners. We're still populated by a staff of keen, active, impassioned cyclists based in three cycling centers: Vancouver, BC, Ferndale, Washington and Geneva, Switzerland. We're not big, nor are we that small. Just a dedicated group of cyclists making bicycles for people who love bikes-no matter if that love is new or long established. Headquartered in Seattle, Washington, Brenthaven is the leader in the design and manufacture of premium protective cases for mobile technology. All Brenthaven products come with a 100% lifetime guarantee and feature superior protection systems that keep you connected to your digital lifestyle. Visit http://www.brenthaven.com for more information or check us out on Facebook and Twitter. For Customer Service call (800) 803-7225 or email info(at)brenthaven(dot)com.